Enunwa (ankle) was listed as a non-participant at Wednesday's practice, Brian Costello of the New York Post reports. Analysis: Per Rich Cimini of ESPN.com, Enunwa was spotted on the field with a helmet at the start of Wednesday's practice, but the wideout evidently didn't do enough to be listed as even a limited participant. Enunwa's status for Sunday's game against the Dolphins thus remains unclear, which is also the case for fellow wideout Robby Anderson (ankle), who was also listed as a non-participant in the Jets' first practice of the week. Enunwa (ankle) was in attendance for practice Wednesday, Rich Cimini of ESPN.com reports. 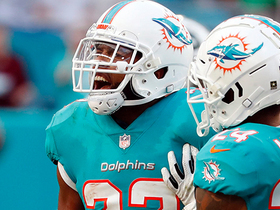 Analysis: A high-ankle sprain kept Enunwa out for the Jets' last two games, but he appears to be trending in the right direction as Sunday's game against the Dolphins approaches. The Jets will relay later Wednesday the extent of Enunwa's practice participation, but at this stage he appears to be ahead of Robby Anderson (ankle), who wasn't spotted on the field for the start of the session. 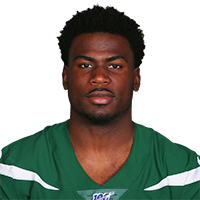 Enunwa (ankle) has been ruled out for Sunday's game against the Bears, Eric Allen of the Jets' official site reports. Enunwa (ankle) isn't expected to return until to game action until after the Jets' Week 11 bye, Andy Vasquez of The Bergen Record reports. Enunwa will be sidelined 3-to-4 weeks with a high-ankle sprain, Ian Rapoport of NFL Network reports. Analysis: Enunwa leads the Jets in targets (43) by a wide margin this season. However, he's only turned that into 22 receptions for 287 yards and one touchdown, while Robby Anderson has acted as the team's deep threat. Enunwa's absence will lead to an uptick in looks for Anderson, Jermaine Kearse and Terrelle Pryor. His nearest return likely is Week 9 against the Dolphins. Coach Todd Bowles said Enunwa has been diagnosed with a sprained ankle, but he's unsure of the severity, Andy Vasquez of The Bergen Record reports. Analysis: Enunwa was knocked from Sunday's eventual win against the Colts in the first half and didn't return. After undergoing an MRI on his ankle, he's confirmed to have an ankle sprain, which one can play through (if it's low) or may require multiple weeks to recover from (if it's high). 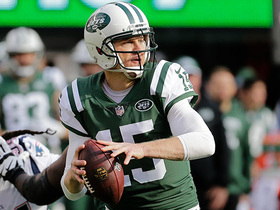 Bowles and the Jets likely will confirm whether he has a chance to play Sunday against the Vikings in the coming days. Enunwa is slated to undergo an MRI on his ankle, Rich Cimini of ESPN.com reports. Analysis: Cimini hints that Enunwa's injury could be significant, which is obviously less than optimal, especially with fellow wideout Terrelle Pryor now dealing with a groin injury. Enunwa (ankle) has been ruled out for the remainder of Sunday's game against the Colts, Manish Mehta of the New York Daily News reports. Analysis: Enunwa was forced to the locker room during the first half of Sunday's tilt with an ankle injury, but he won't be able to return as Robby Anderson, Jermaine Kearse and Terrelle Pryor will be asked to step up at wide receiver. Enunwa headed to the locker room during Sunday's game against the Colts after suffering an ankle injury. Analysis: Per Ralph Vacchiano of SportsNet New York,it "didn't look like (Enunwa) could put weight on his leg before he left," which is not a great sign. In his absence, added looks are available for the likes of Robby Anderson, Jermaine Kearse, Terrelle Pryor and Andre Roberts. Enunwa failed to come down with any of his five targets in Sunday's 34-16 win over the Broncos. 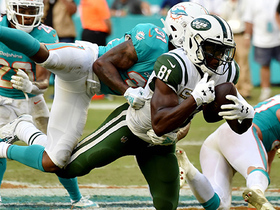 Analysis: Enunwa came into this contest as New York's clear-cut top aerial option, but this time, he took a back seat to Robby Anderson (three catches for 123 yards and two touchdowns). 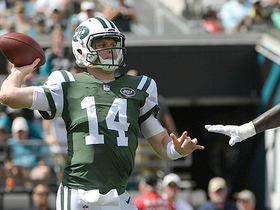 Of Enunwa's five missed connections with quarterback Sam Darnold, one was a deep ball that was just out of his reach in the end zone. Given his strong rapport with Darnold prior to this dud, Enunwa should bounce back in Week 6 against the Colts, but he's still probably best used in PPR fantasy setups. Enunwa (hip) returned to a full practice Friday and doesn't carry an injury designation into Sunday's game against the Broncos, Darryl Slater of NJ.com reports. Analysis: Through four games, Enunwa has logged a team-high 21 receptions (on 37 targets) for 278 yards and a touchdown. Enunwa profiles as a decent fantasy option in Week 5, considering the consistent target load he's been seeing from rookie quarterback Sam Darnold. Enunwa was a limited participant in Thursday's practice due to a hip injury, Andy Vasquez of The Bergen Record reports. 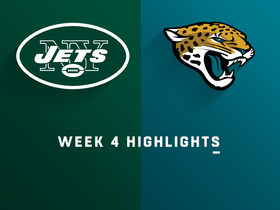 Enunwa caught four of eight targets for 66 yards in Sunday's 31-12 loss to the Jaguars. Analysis: To Enunwa's credit, he was the only Jets receiver to get anything going against the fearsome Jacksonville defense -- none of his teammates managed more than 26 receiving yards. 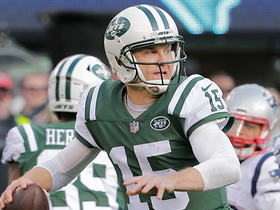 He's emerged as the go-to option for rookie quarterback Sam Darnold, so Enunwa should see plenty of volume against Denver in Week 5. 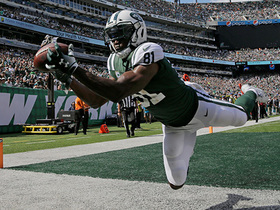 Enunwa brought in four of eight targets for 57 yards in the Jets' 21-17 loss to the Browns on Thursday. 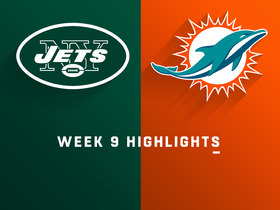 Enunwa caught seven of 11 targets for 92 yards in Sunday's 20-12 loss to the Dolphins. Analysis: Enunwa was Sam Darnold's go-to target throughout the contest, leading the team in yards, catches and targets. The wide receiver got wide open in the back of the end zone late in the first half, but his rookie quarterback overthrew him on what should have been an easy touchdown. Given his ability to create separation and prominent role in the offense, Enunwa should be universally owned after catching 13 balls for 155 yards and a touchdown through two weeks. Enunwa caught six of 10 targets for 63 yards and a touchdown in Monday night's 48-17 win over the Lions. Enunwa is listed as the direct backup to Jermaine Kearse (abdomen) on the Jets' initial depth chart ahead of the team's Week 1 matchup with the Lions. Enunwa (thumb) had a strong weekend on the practice field, Newsday's Bob Glauber reports. Analysis: Looking to rebound from a lost 2017 season, Enunwa made it back for the start of training camp but then missed a couple weeks with a thumb injury. An impressive run at practice puts him on the right track for Friday's preseason game against the Giants, which would be his first in-game appearance since December 2016. It's probably too late for the 26-year-old to push Jermaine Kearse for the No. 2 job, but a role as the No. 3 receiver is still within reach. Enunwa (thumb) is in uniform for Thursday's preseason game against Washington, Darryl Slater of NJ.com reports. Analysis: That said, previous reports suggested that the wideout wasn't expected to play, a notion echoed by Brian Costello of the New York Post. Enunwa is thus a very risky roll in DFS formats this week. Enunwa (thumb) isn't in line to play in Thursday's preseason game against the Redskins, Rich Cimini of ESPN.com reports. Analysis: Enunwa is no longer wearing a cast or wrap to protect his right thumb, but it appears the Jets may want him to put in some more full-contact practices before returning to game action. The wideout seems likely to be ready to play in the Jets' all-important third exhibition contest Aug. 24 against the Giants, when many of the team's core contributors are expected to play for most of the first half. Enunwa (thumb) returned to practice Sunday, Brian Costello of the New York Post reports. Enunwa (thumb) no longer has a cast or wrap over his right hand, Brian Costello of the New York Post reports. Enunwa is slated to sit out the next 1-2 weeks due to a thumb injury, Manish Mehta of the New York Daily News reports. Enunwa missed Wednesday's practice due to an injury unrelated to his neck, Manish Mehta of the New York Daily News reports. Enunwa (neck) isn't practicing Wednesday, Rich Cimini of ESPN.com reports. Enunwa (neck) was a full-go at Saturday's practice, Andy Vasquez of NorthJersey.com reports. Analysis: Enunwa did not sport a red, no-contact jersey at Saturday's session, a great sign towards his eventual return to regular-season action. The 26-year-old wideout missed all of last season with a bulging disc in his neck after having a miniature breakout season in 2016, recording 58 catches for 857 yards and four touchdowns. 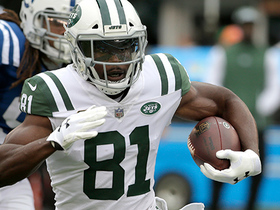 Enunwa will join new arrival Terrelle Pryor and Robby Anderson in the Jets' receiving corps, with the opportunity to see significant action if he can return to form. Enunwa (neck) is practicing in a no-contact jersey Friday at the first session of training camp, Ralph Vacchiano of SportsNet New York reports. Analysis: While he still hasn't gained full clearance, Enunwa at least seems to be a step ahead of fellow wideout Terrelle Pryor (ankle), who was limited to side work with the training staff Friday afternoon. Assuming they're eventually cleared, the two receivers likely will end up battling for playing time behind incumbent starters Robby Anderson and Jermaine Kearse. Given his experience working from the slot, Enunwa should be a good fit for the No. 3 job. Enunwa (neck) practiced with a helmet for the first time Tuesday, but he still only took part in individual drills, Rich Cimini of ESPN reports. Analysis: Enunwa, who is coming off a serious neck injury, being able to successfully practice with a helmet on his a huge step forward in the wide receiver's recovery. Head coach Todd Bowles did say that he will keep Enunwa away from team drills for the rest of minicamp, but the expectation is that the wideout is cleared for full participation in training camp. Enunwa (neck) was seen doing individual drills at the start of OTAs on Tuesday, Connor Hughes of NJ.com reports. Analysis: As expected, Enunwa is limited to start OTAs, and given that he is without a helmet, the wideout is likely still dealing with some lingering neck issues after suffering a bulging disk last season. However, the fact that Enunwa is on the field Tuesday is still an encouraging sign for his recovery, and the expectation is still that he will be a full participant in training camp in July, where he will look to re-establish himself as one of the team's top threats in the passing game. Enunwa (neck) said he may be limited for the start of OTAs on May 22, but he still expects to be a full participant at the beginning of training camp in late July, Rich Cimini of ESPN.com reports. Enunwa (neck) signed his restricted free agent tender Wednesday, Ralph Vacchiano of SportsNet New York reports. The Jets placed a second-round restricted free agent tender on Enunwa (neck), Rich Cimini of ESPN.com reports. 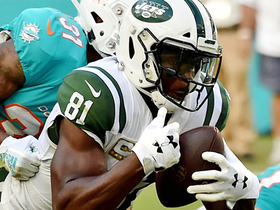 Jets head coach Todd Bowles said Wednesday that Enunwa (neck) is "getting better" but is uncertain to be ready for the start of New York's offseason program, Ralph Vacchiano of SportsNet New York reports.